Scott Downs, organizer of the "Todd Alber Memorial Golf Outing", recently presented Francine's Friends with a check for $2,000 — a record amount for proceeds raised from the annual event held in August at Noble Hawk Golf Course. "We remember Todd for his smile, his many stories and the tomfoolery that sometimes surrounded him. He was the life of the party and was known by several nicknames including “Toad,” “Bird Dog,” “RT” and “Indiana Bob.” Todd was a dedicated son, brother, friend and UPS team member. His kindness, love and enthusiasm touched us all. Todd made the most of life, his black lab (Kip) and the game of golf," explained Downs. "This fifth annual tribute to Todd was bigger and better than ever, and we're thrilled to help support our deserving charities," Downs continued. 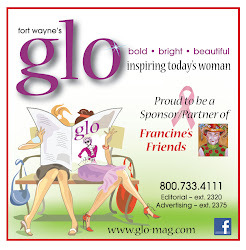 Francine’s Friends and the Allen County SPCA are the two charities of choice. For more information on the annual golf outing, visit tamgo.org.